"LUKE SKYWALKER'S Exciting LAND SPEEDER Vehicle! Authentic replica of STAR WARS LANDSPEEDER has special suspension which shifts from a non-moving position to a "floating ride" on spring loaded wheels. 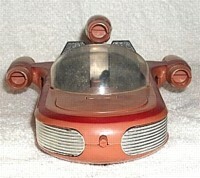 Two cockpit seats can carry Action Figures in front behind a half-moon, clear windshield, and two spaces on rear deck can carry R2-D2 and C-3PO or other Action Figures. Special release button pops hood open revealing TURBO REACTOR and "space hatch" for storage and supplies." The Land Speeder was among the first of the Star Wars vehicles designed for 3¾" figures. (Other 1978 releases were the X-Wing and TIE Fighter.) Due to its relative low cost, it was one of the first vehicles many of us had from the Star Wars line during the early years. 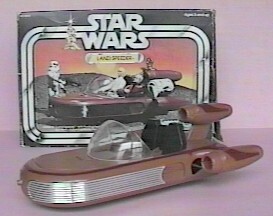 The Land Speeder was not offered as an ESB release but did make a return in 1983 in special "Star Wars Collector Series" packaging. Kenner brought back the Land Speeder, Darth Vader's TIE, and Dewback in essentially the same Star Wars boxes that they had originally appeared. The only difference was the addition of a "Collector Series" logo to the box. No parts are intended to be removable. However, it is not uncommon to find these vehicles missing the seat or windshield.